HA NOI (VNS) — The Asia Commercial Bank (ACB) will be the latest bank to join the wave of mergers among commercial banks and finance companies that is expected to become a major trend this year. ACB had announced yesterday that it would submit for approval, a project to set up a finance company with a charter capital of VND500 billion (US$23.25 million), during its shareholders meeting on April 22. Industry experts said that the wave of mergers of commercial banks and finance companies is expected to continously surge this year to meet legal regulations and boost consumer lending. 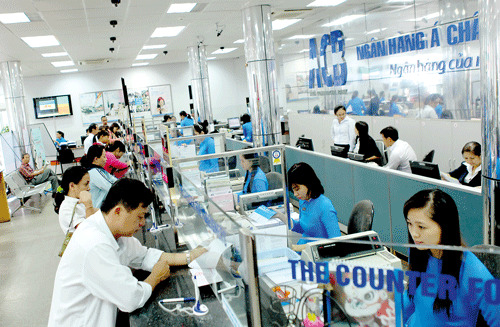 The experts said the move would become a major trend this year, explaining that according to a State Bank of Viet Nam (SBV)'s draft circular regulating the consumer credit activities of financial companies, which is expected to be approved soon, commercial banks would need to establish financial companies if they want to venture into consumer lending. Besides, State-owned groups and firms would also become obliged to finalise capital divestment from non-core businesses, including financial companies, from this year. Senior finance expert Can Van Luc told the Dau tu (Investment) newspaper that State-owned groups and firms were facing huge pressure to exit from financial companies and this was an opportune time for banks to fully merge with these companies and boost consumer lending. Luc pointed out that consumer lending accounted for just 6 per cent of the total outstanding loans in Viet Nam. Meanwhile, this rate was 15 to 20 per cent in many other countries, and as high as 35 to 40 per cent in the US market. Besides, the merger activities of banks and financial firms were forecast to be vibrant this year, as per a SBV circular, which said banks would only be allowed to possess a stake in a maximum of two credit institutions, and the ownership must not be greater than 5 per cent. At present, many banks own several stakes in financial companies, and in many cases their stakes surpass the 5 per cent benchmark. Techcombank, for example, already possesses a 10 per cent stake in Viet Nam Chemical Finance JSC (VCFC). The bank, therefore, had announced earlier this year that VCFC would transfer roughly 90 per cent of their stake to Techcombank in the first quarter this year, bumping up Techcombank's total stake in VCFC to 99.87 per cent. Other mergers between financial companies and banks are also expected to become a reality this year, including between the Sai Gon-Ha Noi Bank (SHB) and Vinaconex-Viettel Finance JSC (VVF), and between the Maritime Bank and Textile Finance JSC (TFC), both of which have received in-principle approval from SBV. Earlier this month, the HCM City Housing Development Joint Stock Bank (HDBank) and the Japanese Credit Saison Company Ltd also formed the HD Saison Finance, in which the two will contribute to develop the retail finance industry in the country.